Battery pack with JST RCY for discharging and JST XH for balance charging. The reality is: we live in a world full of ambiguous connector specifications. We also sometimes choose to ignore “No User Serviceable Parts Inside” and merrily explore guts of equipment to which we have no specifications at all. As hackers, we need some skill at deciphering mystery connectors. We’ll start here with a quick survey of the most popular types from JST. A simple two pin wire-to-wire connector is probably the RCY series. 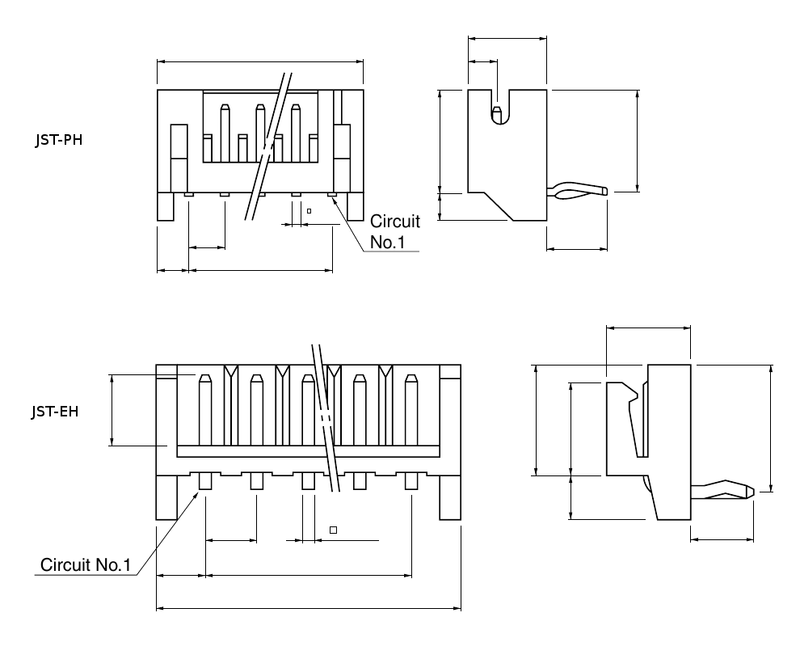 When a connector interface two or more wires to a circuit board instead, it might be one of the following series. A quick way to narrow down candidates is to look at their pitch: the distance between pins. Then identification becomes a matter of comparing the physical features against datasheets. We start with the JST XH series. Its pitch of 2.5 mm is effectively identical to the 0.1″ pitch commonly found on prototyping breadboards. After the XH series, the pin pitch gets narrower, the wires get thinner, and the connectors are more fragile through PH (2.0 mm), ZH (1.5 mm), GH (1.25 mm), and SH (1.0 mm). The SH series are so small that JST specified optional protrusions to give us something to hold. 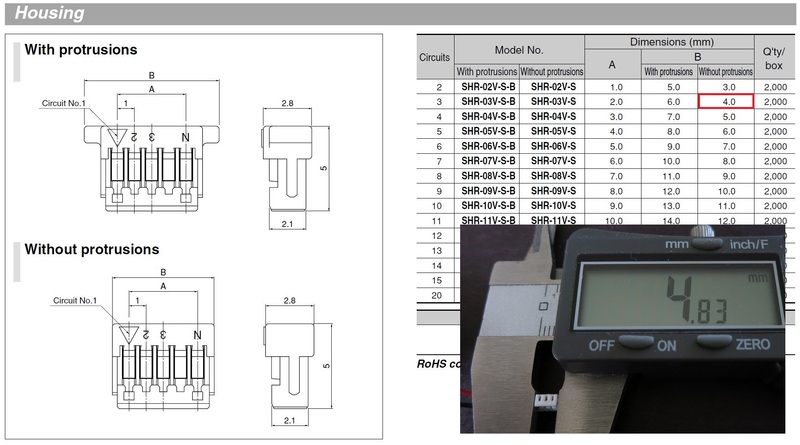 If a mystery connector doesn’t match the datasheet for the popular JST connector in that pitch, then unfortunately the search becomes more difficult. When faced with this task of digging deeper keep in mind the possibility that it might not be a JST connector at all. Surplus inventory are frequently mislabeled and some connectors look too much alike. 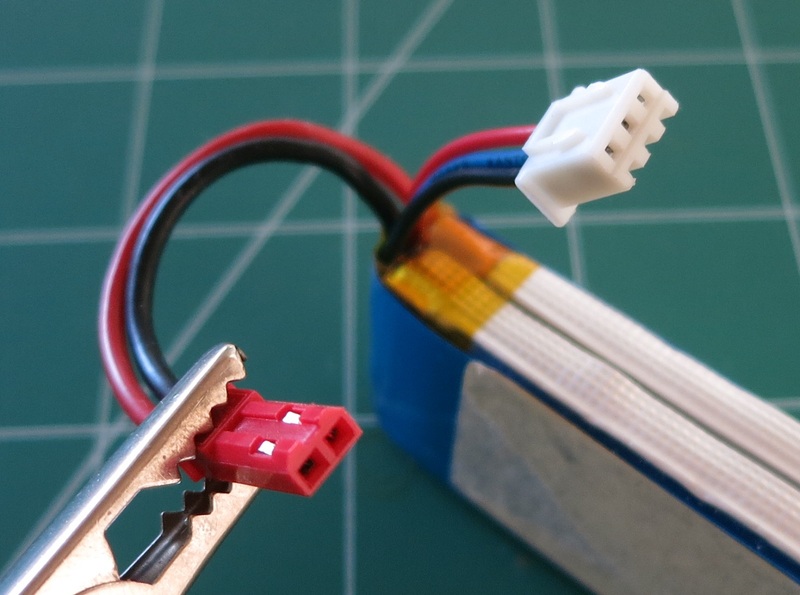 The Molex PicoBlade is a 1.25 mm pitch connector frequently confused with JST GH in the same pitch. This mystery “JST connector” has the 1 mm pitch of the JST SH, but the datasheet says it is too large to be one. As we gain experience with connectors, we’ll make better guesses based on context. The backyard-friendly hobby aircraft ecosystem (airplane, helicopter, and multi-rotor) uses many connectors designed by JST with Molex as a smaller player. 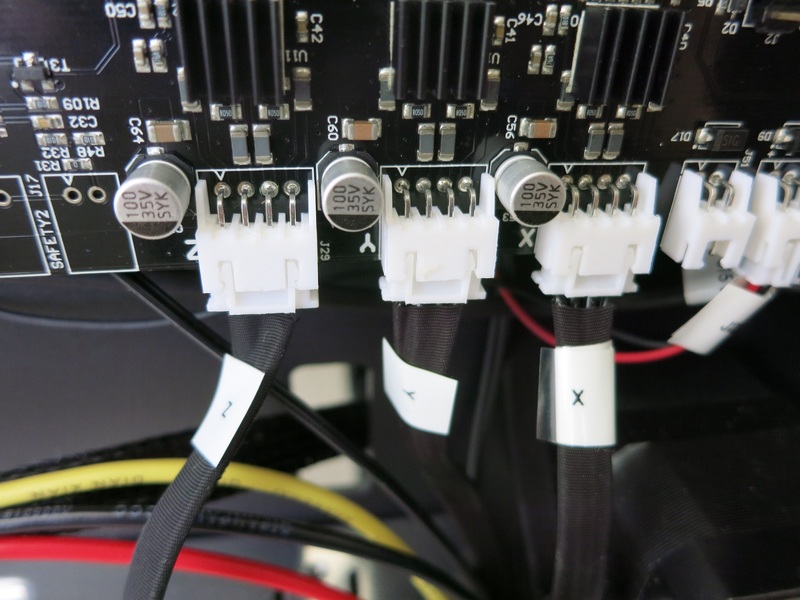 The situation is reversed in PC components where Molex designed most of the connectors in that ecosystem. Such knowledge will come in handy when it comes time to choose a connector. Usually the connectors used in one-off projects are dictated by those already on components built by others, but sometimes the choice is ours to make. It’s better if we understand the context of the project and choose something that fits existing conventions. Help prevent future headaches: be specific about your connectors! Also those are the most common ones found on the Shenzhen market, thus easier to source for your project. THANK YOU! This drives me crazy. It’s not hard to specify! I hear people talk about Molex connectors the same way: no mention of the type. Grrr. What about Nupont fiber woven bowls? I was going to say the exact same thing. Some people at work just says “we should use the Molex connector” and I always go “Which one? Molex makes hundreds of different connectors”. Yep… but nothing a simple wire cutter couldn’t solve… unless there was no (extension) cable supplied, then you need a soldering iron, remove the connector and (patiently) solder the wires to the remaining pads. Excellent post. You see “JST” connector thrown around so much in RC communities (I have to admit, I’m probably guilty of it myself), and it’s good to see some hard facts about just what everyone is referring to. I’m other news, that’s not called a DB-9..
D connectors types: A with 15 pins, B with 25, C with 37, D with 50, and E with 9. The letter is the shell size. Thank-you. I have been referring to “JST” (https://www.thingiverse.com/thing:2437294) when I mean “RCY” even though I knew I was wrong and hadn’t gotten around to finding out what they should be called. This page is particularly good because it discusses the compatibility of cheap substitutes for the tooling. Having 20 different unique sets of tooling which are $500 each, for each different kind of official JST or Molex tooling, just isn’t practical. Excellent info – also explains where the “DuPont Connector” name came from. Thank you so much for this! The different toolings always drives me crazy, even if I have the money (at work) to buy the official tools. 2.5mm is effectively identical to 0.1″ pitch? I cringed. One might also say torx is the same as flat-head because if you jam a flat-head screwdriver into a torx socket you can get it to turn. It also strains the components and doesn’t scale up well. You might be surprised, but I still have a few Russian 40 DIL pins ICs from the communist era that are 2.5mm pitch instead of 0.1 inch. Yet, they can still fit in a standard 0.1 inch pitch socket or PCB. Me too. I got a clone of Intel 8255 PPI from the east, back in 1980s. I used it to build Voja’s EPROM programmer for ZX Spectrum, published in “Galaksija” special edition for home computers #2. If you use “professional” (machined pins) DIL socket, the trick is to try inserting the pins starting from the middle of the socket to the ends, so that maximum offset between IC package and IC socket at both ends is just bearable 0.4 mm, instead of staggering 0.8 mm at far end, in case you insert the IC starting from one end first. Still, some crowbar work is needed adjusting the pins into holes. Using semi-pro (slot contact) sockets is more forgiving. Another fun one for its sheer amount of confusion is the wonderful world of military ‘ITT Cannon’ connectors, accessories, and their related other-manufacturer equivalents and variations. Trying to figure out more odd combinations of connectors, shells, shell couplings and accessories is a headache in and of itself when you have to work across multiple series. Having been in contract manufacturing for the last 17 years, I have seen hundreds of varieties of connectors available from the Molex, Tyco/AMP, JST, Panduit, Samtec, ITT Cannon, Berg, etc, etc. As such, this article at first had me confused as to its purpose since the content is basic. Then I remembered that most people visiting here aren’t dealing with connectors on a daily basis and I realize “wow, this must be seriously useful for the typical HaD audience”. Connectors, and properly specifying them, are a challenge that many of my customers’ PCB designers still struggle with so I could imaging what a hacker must go through when trying to reverse engineer of hack into something. Other things to keep in mind are that full MPNs (Manufacturer Part Numbers) are a must have for any contract manufacturer, especially when dealing with connectors that have numerous options such as tail length, polarizing tabs, plating and plating thickness, notched pins, orientation, pins removed, color, shrouding, etc, etc. The Molex KK series is one of my favorites, but Molex has over 3000 parts of that series alone. Thanks for the article! For a real challenge, try using Samtec’s part number builder to determine a part number for a Samtec header. Not as easy as you would think it is. Oh boy is specifying connectors “fun”. I get to do that at work from time to time and it’s always fun. In the most non-fun way. I have spent hours upon hours reading samtec datasheets and constructing parts numbers. I also second that giving proper Manufacturer Part Numbers helps the assembly folks confidently source the proper connector. Better yet is when a manufacturer drops a connector or a pin and then creates some giant substitution cross-index that doesn’t tell why the original part was dropped and exactly what characteristics were included/removed/changed and drops the old docs from their website. Also, when the part number is different for individual pins vs strip of pins. So when Purchasing goes to buy it they look at the BOM which either calls for individual pins or a reel of 2000 and then they complain about either one. Does Manufacturing step up and create an assembly of assemblies to account for the production run so this can be handled properly? No. Because QA won’t inspect the composite without the assembly of assemblies being released by Design. This is in a multinational medical equipment business that wants to keep their business rules simple and managed in a 10,000 page manual. And that’s how you get an SAP database that uses comment lines as part of the BOM so that BOM roll-ups fail. Just another “Gold Standard” like Kleenex. There is a website which lists many connectors with their pictures and Wikipedia links. I came across it when I was searching for a connector I had. I don’t remember the name now. If anyone else knows that , please comment and let us know. I use pinouts.ru for a lot of this type of info. Yeah. I know that website. There is another one. I refer to them as the connectors I am going to break. They get brittle from heat and ozone plus the design and where they are located means I can’t get my hand in a good position to remove it. I always end up snapping off pieces of them but they do stay on without the tabs, There is another similar type of connector I may be confusing this with but I’m not 100% sure. “Generic substitute of 2.50mm JST-XH (MPN xxxxxx)” or “Generic substitute of 2.54mm Molex KK (MPN xxxxxxx)” (or whatever common connector, pick your favorites) are perfectly valid connector choices that I use a lot, in some cases. You *know* you’re getting Chinese copies, and in many applications that’s okay. Both sides of the connector mate with each other reliably, and you’re not pushing the connector close to its electrical limits. I’ve had generic jst-rcy connectors so loose that they plug in reverse polarity if your not careful. 2.50 is not 2.54! Sure, for up to 7+-1 pins it’s likely to work,but if you get further than that, they’re incompatible. Your point is well taken and I agree. An earlier draft had the qualifier “for small number of pins” but that got lost during editing. Then there are those flat double staggered row tiny connectors in Italian and German keyboards. Beware of JST clone connectors. The ones I’ve seen are noticeably inferior to genuine JST parts. The contact plating tends to acquire a black, greasy tarnish, and the plastic housings are softer with inferior retention. With name-brand connectors costing pennies through Digi-Key, the knockoffs are a false economy. If you switch between those series in your EDA software without re-connecting nets to reflect this, nasty surprises may result.